What’s in a name? Naming the Coy girls! I am almost 24 weeks along and we thought it was about time to come to a conclusion. We have not passed out womb assignments, so we may wait and see which name is appropriate for each girl when they are born. 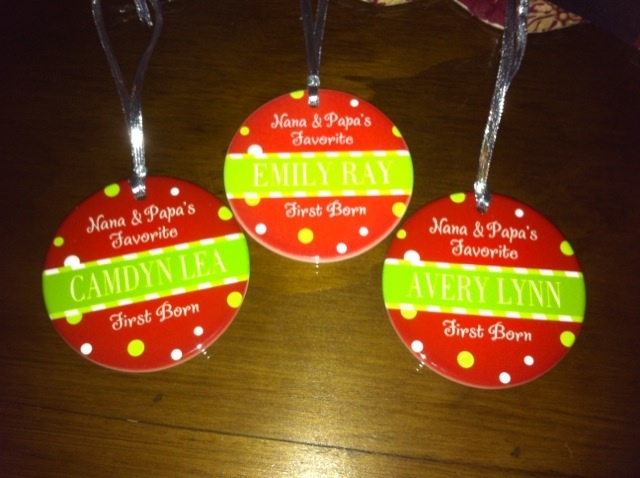 We had personalized ornaments made for both of our parents. Each ornament said, “Mimi and Papa’s/Nana and Papa’s favorite first born” The name of each granddaughter was in the center of the ornament. Of course, favorite first born is sort of funny because they are all first borns! Here is a pic of what we gave our folks about a week ago. If it is hard to read, we chose: Avery Lynn, Emily Ray and Camdyn Lea. Lynn is Bryan’s mom (Nana) middle name, Ray is my dad’s middle name (Papa) and Lea is my mom’s (Mimi) and Bryan’s dad’s (Papa Randy). They now have an identity which is surreal. That was apparent this year at Christmas since they had gifts with their actual names on them! Very surreal. Loving every moment of the excitement of watching our children have children. For Bryan and Stephanie, Coys and Hansens, we begin a journey of blessing after blessing. How blessed we are and what better parents could these girls have.